Professor Neidig’s research interests fall within the areas of organometallic chemistry, non-precious metal catalysis in organic synthesis and f-element chemistry. At the core of research in the Neidig group is a novel experimental approach using inorganic spectroscopies, density functional theory and synthesis combined with kinetic studies to develop molecular-level insight into electronic structure and bonding in non-precious metal organometallic complexes, active catalyst structure and the mechanisms involved in current leading-edge non-precious metals catalyzed reactions in organic synthesis. One major effort in the Neidig group focuses on iron-catalyzed cross-coupling reactions, where a growing body of research has demonstrated that iron can be an excellent catalyst, effecting cross-couplings that have proven difficult for platinum group metals such as the coupling of alkyl halides and Grignard reagents with both high activity and selectivity. As a representative example, in the area of iron-bisphosphines we have established that a combination of Mössbauer, MCD and DFT methods was demonstrated to be a highly impactful methodology for the investigation of the iron-catalyzed Kumada coupling of MesMgBr and primary alkyl halides. These studies permitted the identification of the active catalyst species, insight into the effects of the reaction protocol on in-situ iron speciation and catalytic performance and direct insight into the molecular-level mechanism of catalysis. Additional studies have focused on the nature of the iron-ate species formed in cross-coupling reactions using simple ferric salts, including the identification of Fe8Me12- as the long sought after S = 1/2 species of Kochi. In another major effort, the Neidig group is studying the active catalyst species and mechanisms involved in iron- and cobalt-catalyzed direct C-H functionalization reactions. In this chemistry, we utilize an approach combining multiple inorganic spectroscopies (magnetic circular dichroism, Mössbauer, electron paramagnetic resonance, resonance Raman), density functional theory, synthesis and kinetic and reaction studies in order to elucidate detailed electronic structure and bonding insight in iron- and cobalt-organometallics involved in these reactions. Ultimately, the development of such fundamental insight into structure, bonding and mechanism in iron- and cobalt-catalyzed direct C-H functionalization is critical to inspire and facilitate the rational design and development of systems with improved catalytic performance. An additional research area in the group focuses on electronic structure and bonding in f-element chemistry. The objective of our research program in this area is to develop and apply advanced inorganic spectroscopic methods to actinide chemistry, including well-defined compounds, in-situ generated complexes and transient species in order to advance our understanding of electronic structure, bonding and reactivity in heavy element systems up to the level currently available for transition metals such as iron and palladium. 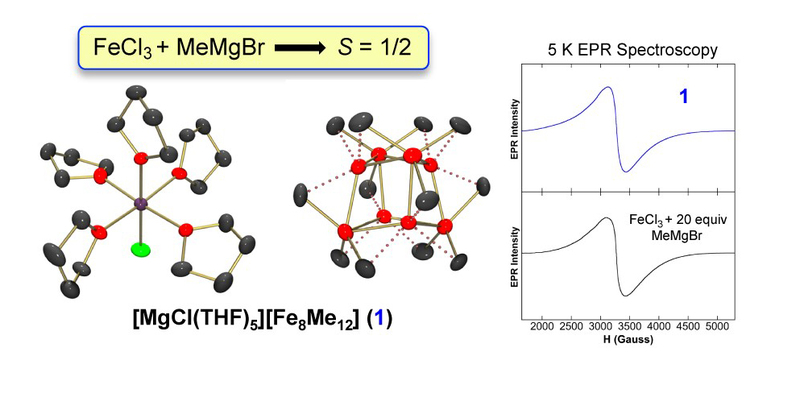 Muñoz III, S. B.; Daifuku, S. L.; Brennessel, W. W.; Neidig, M. L., “Isolation, characterization, and reactivity of Fe8Me12-: Kochi’s S = 1/2 species in iron-catalyzed cross-couplings with MeMgBr and ferric salts,” J. Am. Chem. Soc.2016, 138, 7492-7495. Kneebone, J. L.; Fleischauer, V. E.; Daifuku, S. L.; Shaps, A. A.; Bailey, J. M.; Iannuzzi, T. E.; Neidig, M. L., “Electronic structure and bonding in iron(II) and iron(I) complexes bearing bisphosphine ligands of relevance to iron-catalyzed C-C cross-coupling,” Inorg. Chem.2016, 55, 272-282. Spasyuk, D. M.; Carpenter, S. H.; Kefalidis, C. E.; Piers, W. E.; Neidig, M. L.; Maron, L., “Facile hydrogen atom transfer to iron(III) imido radical complexes supported by a dianionic pentadentate ligand,” Chem. Sci.2016, 7, 5939-5944. Daifuku, S. L.; Kneebone, J. L.; Snyder, B. E. R.; Neidig, M. L., “Iron(II) active species in iron-bisphosphine catalyzed Kumada and Suzuki-Miyaura cross-couplings of phenyl nucleophiles and secondary alkyl halides,” J. Am. Chem. Soc.2015, 137, 11432-11444. Butschke, B.; Fillman, K. L.; Bendikov, T.; Shimon, L. J. W.; Diskin-Posner, Y.; Leitus, G.; Gorelsky, S. I.; Neidig, M. L.; Milstein, D., “How innocent are potentially redox non-innocent ligands? Electronic structure and metal oxidation states in iron-PNN complexes as a representative case study,” Inorg. Chem.2015, 54, 4909-4926. Fillman, K. L.; Przyojski, J. A.; Al-Afyouni, M. H.; Tonzetich, Z. J.; Neidig, M. L., “A combined magnetic circular dichroism and density functional theory approach for the elucidation of electronic structure and bonding in three- and four-coordinate iron(II)-N-heterocyclic carbene complexes,” Chem. Sci.2015, 6, 1178-1188. Al-Afyouni, M. H.; Fillman, K. L.; Brennessel, W. W.; Neidig, M. L., “Isolation and characterization of a tetramethyliron(III) ferrate: An intermediate in the reduction pathway of ferric salts with MeMgBr,” J. Am. Chem. Soc.2014, 136, 15457-15460. Daifuku, S. L.; Al-Afyouni, M. H.; Snyder, B. E. R.; Kneebone, J. L.; Neidig, M. L., “A combined Mössbauer, magnetic circular dichroism and density functional theory approach for iron cross-coupling catalysis: Electronic structure, in situ formation and reactivity of iron-mesityl-bisphosphines,” J. Am. Chem. Soc.2014, 136, 9132-9143.